1. Pinch the barb and slip the cone on. 2. Tie in your thread - 6/0 brown. Wrapping back toward the hook bend. 3. 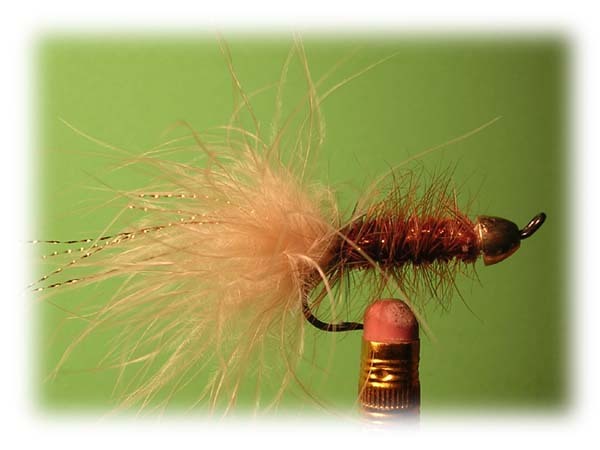 Tie in a marabou feather - either tan or brown. 4. Use about 6 strands of k-flash. A little trick is to cut about double the length of k-flash needed. In this case about 3" or so. Then fold the flash around the thread and tie in that way. As opposed to tying in by the ends of the k-flash. 6. Tie in two brown hackle - the hackle barble should be max - 1.5 times the hook gap. 7. Tie in the chenille and move the thread to the front - next to conehead. Wrap chenille forward - creating a nice smooth body. Consistency in the thickness is what you want. Tie off. 8. Palmer both hackles up through - not at the same time though. In succession. Tie both off. 9. Apply cement and you are done. Once you get the hang of it, you can crank these flies out. Here is a really simple tie that is extremely effective anytime of year. A brown bugger is a sure-fire pattern in streams that have a high population of crayfish or other types of large bottom dwelling nymphs. We have fantastic success with it on the Lehigh River. Look to give it a try along with black buggers early on in the trout season when waters are running hard and cold. Give it a try! Oh yeah, olive works really well too.